Hair Of The Dog That Bit You: Will Drinking Alcohol Cure Hangover? After a night of drinking, it is quite common to wake up with a bad hangover with symptoms such as headache, thirst, and light sensitivity. Some people try to cure these symptoms by drinking more alcohol. This method is referred to as the hair of the dog in urban slang. Why is it called the hair of the dog? Does it help to drink a beer before work after a night on the town? And are there any dangers associated with this practice? Let’s find out. What is the hair of the dog? How does drinking more relieve hangover symptoms? Does the hair of the dog work? What alcohol works best for a hangover? How much alcohol shall one drink when hungover? 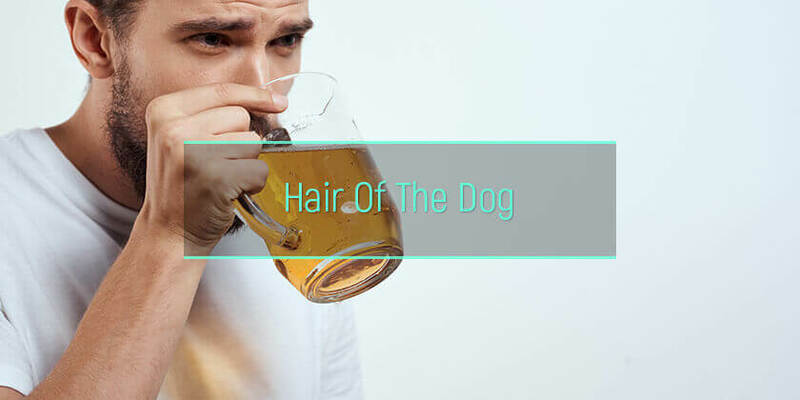 What are the dangers of the hair of the dog method? Hair Of The Dog Saying: What Does It Mean? The colloquial expression the hair of the dog that bit me refers to the consumption of more alcohol within 24 hours of a drinking session to lessen the uncomfortable effects of a hangover. The term originated in ancient times when it was believed that evil effects could be avoided by placing a few hairs from a rabid dog in a bite wound. The ancient Greeks believed an individual bitten by a rabid dog could be cured by potions containing the dog’s fur. The practice dated back to Hippocratic times when it was believed “like cures like” or something that causes an ailment can also cure it. In modern times, the phrase means drinking more of what is causing unpleasant symptoms, i.e., the hair of the dog beer to cure a morning-after hangover. Metabolism of Alcohol Congeners: Chemicals called congeners, which are present in varying amounts in different alcoholic beverages, contribute to the severity of hangover symptoms. For example, methanol is a congener found in beer and wine. The body converts methanol to toxic metabolites that increase the severity of hangover symptoms. Ethanol and methanol are metabolized by the same pathways in the body. When an individual consumes hangover drinks, the body excretes the methanol as is instead of turning it into toxic chemicals. Essentially, by adding more ethanol to the body, the appearance of symptoms is delayed. Endorphin Boost: Drinking alcohol causes a short-term increase in endorphins in the body. These are feel-good chemicals that can mask the unpleasant symptoms of a hangover. Additional drinks, therefore, temporarily distract a person from some of the nastiest symptoms of a hangover. Blood Alcohol Level: Hangover symptoms develop when the body metabolizes ethanol and blood alcohol levels fall. The reasoning behind the hair of the dog is that drinking more keeps the blood alcohol level high and staves off hangover symptoms. Methanol versus Ethanol: There is a theory that pick-me-up drinks after a night of heaving drinking work. It is believed that a hangover is the result of tiny amounts of methanol that poison the body and cause the typical symptoms. Drinking additional alcohol adds ethanol to the system, which replaces the methanol and thereby relieves the symptoms. This is based on the fact that ethanol is used to treat methanol poisoning. However, in terms of a hangover cure, this theory remains unproven and is merely a hypothesis. The hair of the dog drinks are not a cure for hangovers. They are simply a quick hangover cure that works for the short-term. Additional ethanol delays the development of symptoms by temporarily masking them. It merely prolongs the time until a hangover is experienced. The hair of the dog cannot prevent the effects entirely. Eventually, a person has to stop drinking, and the symptoms return, worse in severity due to the excessive amounts of ethanol consumed. 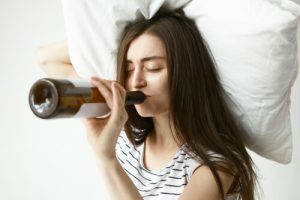 The temporary endorphin boost from the hangover drink is followed by a crash, and this is thought to play a role in the development of addiction. Studies have found that drinking to relieve hangover is associated with heavier consumption and alcohol use disorder. A person does not have to drink the same alcohol they drank the night before to relieve a brutal hangover. The best hangover cures contain a cocktail of ingredients, such as eggs for energy, fruit and vegetable juices for hydration, vitamins, and electrolytes, and seasoning for flavor. What to drink after a hangover? Bloody Mary fits the bill because it contains vitamin-packed tomato juice, spices to sharpen the senses, and a shot of vodka to take the edge off. Mimosa mixes light alcohol with hydrating orange juice and is a favorite hair of the dog drink. A concoction of egg white, gin, lemon juice, sugar, and club soda is another popular hangover cocktail with a refreshing citrus flavor. Crisp, light beers are also a good choice. It is also a good idea to read what to eat after a hangover to choose the snacks wisely. Hair Of Dog: How Much Alcohol To Drink? The trick for the hair of the dog hangover cure is to drink a small amount of alcohol first thing in the morning. This helps increase blood alcohol levels and relieve the worst symptoms of a hangover. A small amount of alcoholic beverage is enough to get a person through the day by knocking off the most unpleasant symptoms. Drinking too much can lead to drunkenness and an even worse hangover a few hours later. The hair of the dog drinks is a temporary remedy that slows the development of symptoms and offers momentary relief. It is not a long-term solution to deal with the after-effects of alcohol consumption. A hangover cure drink merely postpones the symptoms. Ultimately, it takes the body longer to recover. Drinking more after a night of heavy alcohol consumption is not a good idea. The hair of the dog is a quick fix, but it is not the healthiest way to treat a hangover. The excessive ethanol intake from the additional drinks can lead to serious health effects. Besides, drinking practices such as the hair of the dog are associated with an increased risk of drinking bouts leading to alcoholism. Luckily, there are many alcohol dependence rehabs offering the treatment options of substance dependent individuals. Their treatment approaches to alcoholism may differ, so it is important to find the one that fits the needs of the specific person.